Conveyors are the bridges between the islands of automation on any packaging line. Belt conveyors us a continuous belt material as opposed being made up of individual links as in chain conveyor. There are literally hundreds of belt materials to choose from. 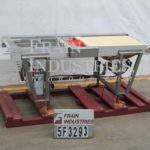 These range from very rough belts where high friction is required to carry a case up an incline, to smooth belts that sanitary and easy to clean for direct contact with foods. Belts can be solid metal to carry cake batter through ovens of cooking, or wire mesh for enrobing candies. Belts can be flat or can be formed into a U or trough. They can include sides and lugs up to several inches high. Belts can range in width from less than an inch to several yards wide. Conveyors can be as short as a foot or two or, in some applications, several miles long. Most belt conveyors are straight running. Belting doesn’t easily bend around curves but there are plenty of belt curves and even spiral elevators. It is hard to imagine a belt conveyor design that isn’t readily available. But if you do imagine one, there is surely someone who can build it. Belt conveyors used in packaging generally come in two types: Slider bed and roller bed. The belt rides directly on the conveyor frame in a slider bed design. A plastic liner may be used between frame and belt to reduce friction. Slider bed conveyors are simple and work well where belt speeds and loads are not high. If higher speeds and loads are required, a roller bed design may be used. A series of rollers is mounted on the frame with the belt riding on top of them. The rollers eliminate virtually all friction on the belt. Belt conveyor frames may be made from stainless or painted steel, plastic, aluminum or other materials to suit. Various types of belt splices may be used depending on the application. If the belt needs to be removed periodically, perhaps for cleaning, an alligator or similar splice should be used. This permits unsplicing by removal of a pin. The alligator cause several other problems. If the conveyor is used directly for conveying food products, the splice will collect product and may be difficult to clean. Since the splice is not smooth, it may also damage the product if the product slides over it. A seamless, or nearly seamless, splice can avoid these issues. The ends of the belt are skived so that they overlap smoothly. The ends are then glued or vulcanized together. This makes for a strong, smooth, splice but may be beyond the capabilities of some plants to do in-house. It can also make the belt difficult to remove. If that become necessary. Unlike most chain conveyors, belt conveyors can be run in either direction, drive permitting. Drive may be with AC or DC motors, servo motors or even pneumatic motors. Belt conveyors are the ideal choice for small or fragile products that might get damaged or scuffed by a chain conveyor. The monolithic surfaces makes them a breeze to clean, too. Kamflex, Model 731, 40" wide x 305" long stainless steel mesh conveyor. Rated to 100 ft per minute. 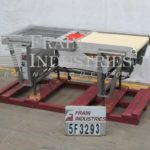 Conveyor top is adjustable from 34½" – 40¼" H. Equipped with ½ Hp motor. Mounted on stainless steel frame with 6 locking casters on adjustable legs. Sprocket diameter is approx. 4". Stainless steel, 34.5" wide x 78" long, stainless mesh belt conveyor. Equipped with a 1 hp drive and start/stop controls. Mounted on a stainless steel frame with a 42" wide x 56" long drip tray and casters. Currently set at a 44" high infeed / discharge. Dorner, Model 2200, aluminum frame belt conveyor. Equipped with a 12" wide x 36" long belt powered with a 28" to 36" infeed / discharge range and variable speed controller. Bullnose style feed and transfer conveyor system. Feed system is equipped with two belts working in conjection with one another one 74" wide x 72" long and one 12" wide x 74" long, that open up to drop down a single row of product on to 6" wide x 101" long white neopreme transfer conveyor. Features 74" long over head row holder, product photo eyes and safety guarding. Bull nose style, transfer system designed to do right angle transfer of conveyed products. Equipped with a 74" wide x 72" long top belt and a 74" wide x 12" long top belt with a closing bull nose mechanism which allows product to either continue through or drop down onto a 6" wide x 101" long bottom belt traveling in the transverse direction. Features 74" long over head row holder, product photo eyes and safety guarding. 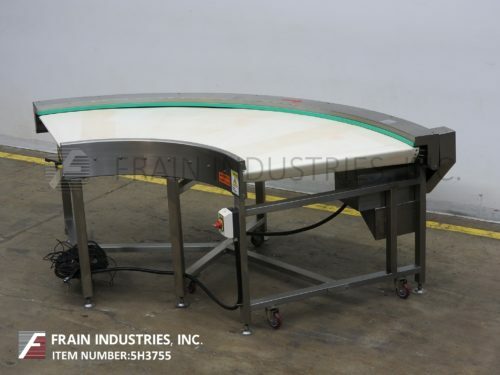 90° curved, 39" W x 102" L, Stainless steel, belt conveyor. 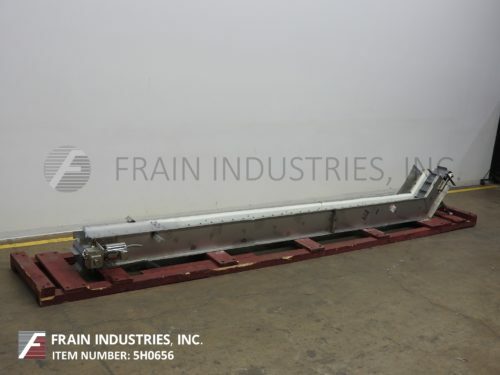 Product travels 48" in to a 90° curve, then travels 54" before discharging. Mounted on (6) height adjustable legs with casters. Stainless steel, belt conveyor. Equipped with a 30" wide x 130" long Neoprene belt powered by a ½ Hp drive and mounted on (4) leveling legs with an infeed / discharge range of 35" to 41". GES, stainless steel, inclined cleated conveyor. Equipped with a 28" infeed, 8" wide Intralox style conveyor belt with 2" high cleats set on 6" centers. Conveyor has a 30" long bottom horizontal run, 204" long incline and a 214" discharge. Powered by a ¾ hp motor drive. 3 belt conveyor system. Equipped with a 37" long x 26" wide flat top conveyor, 10" long x 27" wide eagle belt conveyor, 37" long x 28" wide steel mesh conveyor, 37" high infeed/discharge and mounted on a stainless steel frame.